Carefully Twist ends sideways in order to open and close the ring. This Daith Ring is in the shape of a crescent moon and looks amazing in a piercing. It is made out of 925 Sterling Silver and is therefore only suitable for healed piercings. The ring is 1.2mm (16 gauge) in thickness and the moon measures 12mm high by 7mm wide. 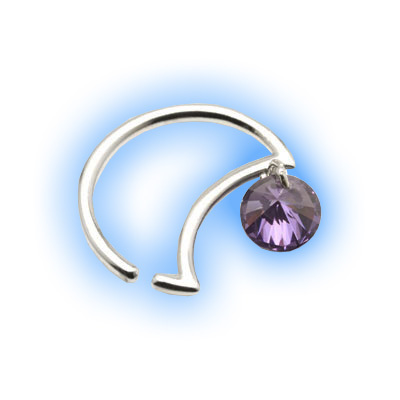 It has a lovely sparkly dangling Lilac Gem (usually worn at the top of the piercing) to set it off. You can select this design for either left or right ear piercings.